Dale Travis as Marquis de la Force and Isabel Bayrakdarian as Blanche de la Force in the Lyric Opera of Chicago production. Momento #1 of that production I haven’t yet seen was the DVD. 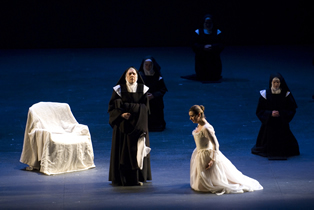 I reviewed it a few weeks ago, fascinated to see Robert Carsen’s take on Poulenc’s opera Dialogues des Carmelites in its La Scala incarnation from 2004. I stumbled upon Momento #2 at the Edward Johnson Building’s Library at the University of Toronto, a treasure trove of scores, recordings and yes, books too. The volume in question appeals to me mostly as a picture book, another by-product of the La Scala collaboration between Carsen & Muti that led to the DVD. It bears the title Francis Poulenc Dialogues des Carmelites, and includes the names “Riccardo Muti” and “Teatro alla Scala” even though as far as I can tell, Muti did not write any of the essays in the book. It’s atmospheric, conjuring up the time when the opera premiered in 1957: at La Scala. Poulenc may have been thinking like a Broadway artist, trying his opera out in the boonies (ha… Milan would never see it that way) before bringing it to Paris. Forgive me if this sounds impertinent. There are many great photos of Poulenc, of the first production and the recent one on the video as well. Ah but I suspect there’s a great deal of politics behind this book, especially after reading a fascinating blog post from Albert Innaurato this week. Clearly Muti had supporters and detractors, and maybe the book was itself a battle site, a skirmish between factions. I’ll know better when i finish reading it. Speaking of pictures, if one were to attempt to gauge the relative importance of the director or the conductor(or their power in the company) it’s 7-1, Carsen only managing to get into the same group bow with Muti on stage after the opera. I would have liked to have seen something of the creative process; but then again, perhaps Muti did not like the production? I regret that I won’t likely find out much more about Muti. I recall surveying recordings of Le Sacre du Printemps decades ago, eating up the ear-candy of Muti’s reading with the Philadelphia Orchestra, its solo playing of stunning virtuosic clarity, the tuttis powerful yet supple; I found it a bit too self-infatuated, not unlike his photos (or maybe i’m jealous that he’s handsome as a matinee idol). But to my youthful ear it was great fun all the same. The grown up Muti is a man of more balance and reserve. His Dialogues –as I observed—makes the case for the orchestra he’s built in Milan. This is the man whose moving reading of “Va pensiero” –including his comments about cuts to arts funding as an attack on the country, and invitation to the audience to join in the encore—showed more integrity, and yes, cojones (sorry I don’t know the Italian equivalent) than any conductor I know of anywhere. Whatever the subtexts, it’s a beautiful book. If you look for it online it’s still available new & used. This entry was posted in Books & Literature, Opera, Reviews and tagged Albert Innaurato. Bookmark the permalink. Thanks, though I am changing my name to Mrs. John Claggart, who could ever manage the name Innaurato? NO ONE, that much I know. I got to like Muti very much and have heard truly great performances from him in concert; opera really is a more collaborative enterprise and singers need more flexible support than he will give, unless he’s really convinced the music allows for it (on the other hand when he can establish a rapport he’s wonderful with that particular singer).. He’s an amazing musician and technician, also a virtuoso pianist (when Richter rehearsed the Brahms Second with just another piano instead of the entire orchestra Muti played and Richter stood up and cheered him at the end. He was a student at the time!!) But so many factors apply for any high profile conductor that I can easily imagine those who aren’t convinced and as for the careerism….!. Thank you for the fascinating reply! What’s in a name? it’s a site to show respect if nothing else. The least i can do is spell it right, AND address one as they wish to be addressed. Among other gifts to be envied, I can imagine what it’s like to have a four letter name.